Like a tune-up or a brake inspection, tire rotations and wheel alignments should be on your checklist of car maintenance services that need to be performed by a professional mechanic on a routine basis. For over a decade, TransMedics has been a complete source for comprehensive vehicle services, including tire rotations and wheel alignments — no appointment necessary! Bringing your car to TransMedics for regular tire rotations is the most important step you can take to extend your tire’s operational life. Why? Because front and rear tires wear disproportionately, rotations work to balance the workload. This results in more even wear on tread. We recommend this service be performed during every other oil change. Do you notice that even when driving on a flat, even road, your car, truck or SUV constantly wants to pull to either the left or the right? That probably stems from your car being out of alignment. 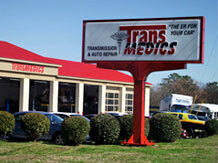 Luckily, you have TransMedics — your local source for wheel alignments in Raleigh. A car wheel alignment can be performed in our North Raleigh auto shop in a relatively brief matter of time. Our mechanics will quickly work to align your wheels, making an adjustment that will recalibrate your tires so they will point directly forward. For a tire rotation or wheel alignment in North Raleigh, schedule an appointment or simply drop by our auto shop at 5120 Old Wake Forest Road. We look forward to serving you and your vehicle!